New York, New York (March 14, 2019) – The American Society of Landscape Architects, New York (ASLA-NY), the New York City chapter of the national professional organization representing landscape architects, today announced the recipients of the Chapter’s 2019 Design Awards. Organized by the ASLA-NY Chapter Awards Committee, the Design Awards bolster local visibility, acknowledge and promote the work of the Chapter’s membership, and publicly recognize excellence in the practice of landscape architecture. From iconic projects that celebrate diversity and generate pronounced community benefits, to sites that integrate resiliency strategies to defend from the impacts of climate change, preserve a historic site’s cultural legacy, or utilize innovative design approaches to resolve singular challenges, this year’s award-winning submissions showcase the full range of the landscape architectural profession. With locations that vary from the urban realm and commercial mixed-use, to suburban residential projects, and sustainable regenerative waterfront programs, this year’s submissions demonstrated the diverse application of the practice and its long-term value to people and the environment we live in. Juried by an interdisciplinary team comprised of members of the Illinois chapter of the American Society of Landscape Architects (IL-ASLA), this year’s entries recognized one award of excellence, 14 Honor awards and 17 Merit awards. The 2019 Design Awards will be presented at the 2019 ASLA-NY Design Awards Ceremony and Reception sponsored by Victor Stanley on April 11 at 6:00 pm, at the Center for Architecture, 536 LaGuardia Place in Manhattan. The projects will be on exhibit at the Center for Architecture through the month of April in celebration of World Landscape Architecture Month. The exhibit is sponsored by Forms + Surfaces. Inspired by community input and the site’s rich history, Domino Park reconnects the Williamsburg neighborhood to the East River for the first time in 160 years. The five-acre park offers a range of activities: beach volleyball, a playground, a dog run, a taco stand, water features, lawns and plentiful seating. 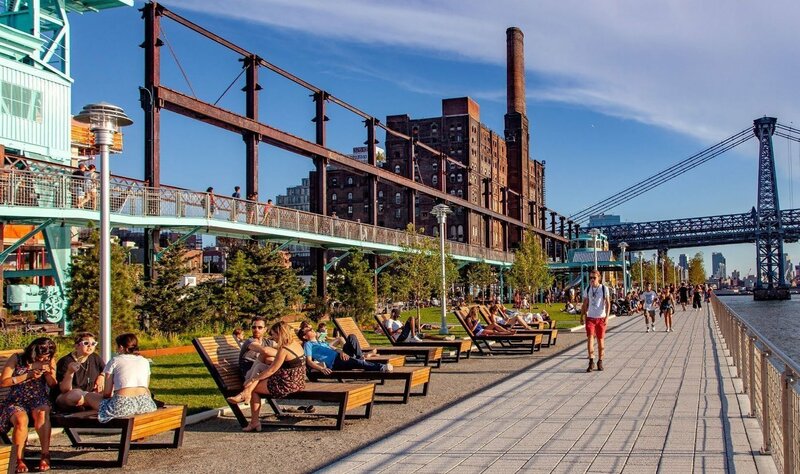 The park celebrates the history of one of New York’s most iconic industrial waterfront sites by integrating over 30 large-scale salvaged relics, including 21 original columns from the Raw Sugar Warehouse, gantry cranes, screw conveyors and syrup tanks. It functions as a resilient and absorbent sponge and the neighborhood’s first line of defense against super storms. Since its opening, Domino Park has become a magnet, embraced by the diverse community it serves. The award-winning projects will be on display in an exhibit at the Center for Architecture throughout the month of April 2019. For more information about the ASLA-NY 2019 Design Awards, visit aslany.org. features 49 professional chapters and 76 student chapters. The New York Chapter, founded in 1914, encompasses the five boroughs of New York City, Nassau and Suffolk counties on Long Island, and Westchester, Putnam, Dutchess, Orange and Rockland counties. The Society’s mission is to lead in the planning, design and care of both our natural and built environments. While keeping pace with the ever-changing forces of nature and technology, landscape architects increasingly have a profound impact on the way people live, work and play.